British travelling photographer and publisher of continental views Francis Frith spent 6 weeks following the course of the Rhine and stopping at tourist sites in Switzerland, Austria and Germany. His photographs illustrate scenes from Henry Wadsworth Longfellow's novel Hyperion. In the accompanying text, Longfellow's fictional hero Paul Flemming's "next stopping-place was the little tavern of theStar, and out-of-the-way corner in the town of Salzig. 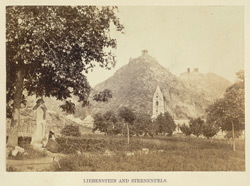 It stands on the banks of the Rhine; and directly in front of it, sheer from the water's edge, rise the mountains of Liebenstein and Sternenfels, each with its ruined castle. These are the Brothers of the old tradition, still gazing at each other face to face; and beneath them in the valley stands a cloister..."